It’s no secret that, after the 2011 Arab Spring, Western Salafism has become an identity and political movement that took on tremendously different forms through its media usage. Salafist contemporary discourse draws from an “authentic” and “purist” Islamic tradition based upon the religion of the al-salaf al-salih (righteous predecessors or companions of Prophet Muhammad and the first generations of Muslims). Yet it also borrows from the discourse of Western modernity, which ironically is often critiqued in this same discourse. Present-day German Salafists, for instance, skillfully remediate their religious authority within the affordances of websites and video channels, social and political pressures in Germany, as well as within postmodern appeals to self-affirmation and self-authentication. This remediation creates a new Salafist authority that enables Salafists to validate their doctrine as an answer to all modern ills and to mobilize their followers for their call to spread Islam. Religious authority historically has been marked as having a contentious relationship with the development of newer communication technologies. Indeed, the German Salafist scene shows a rather complex reciprocal engagement with technology and lived experience, which has shaped its ideological characteristics. It has been emerging in a tumultuous political environment of streets protests, official bans of Salafist organizations, raids of mosques, closures of websites, and the reinvention of Salafist religious authority in new offline and online communities. 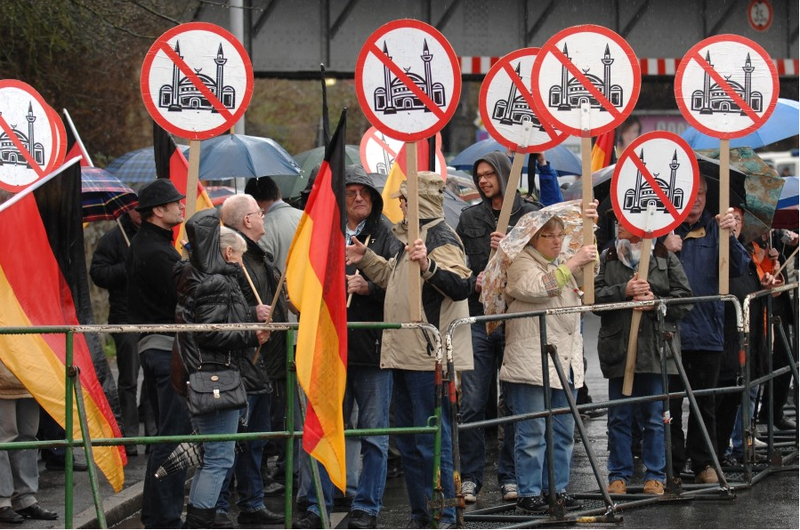 In May 2012, clashes began between the right wing group Pro NRW (North Rhine-Westphalia) and self-proclaimed Salafist members of Millatu Ibrahim – an organization founded in 2001 with a strictly monotheistic interpretation of Islam modeled on that of the Prophet Ibrahim. Pro NRW provoked the Salafists with pictures of the Prophet Muhammad, among others, on picket signs, which erupted in altercations that left two policemen seriously injured. 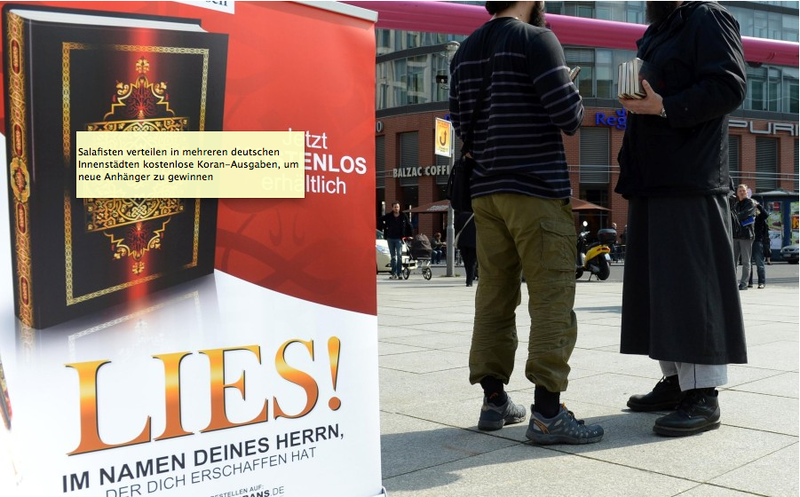 The newspapers sensationalized this event as jihad arriving in Germany. Shortly after, the Federal Minister of the Interior, Hans-Peter Friedrich, ordered the ban of Millatu Ibrahim. On the same day, hundreds of police officers conducted raids of mosques and private homes of Salafists in seven German states – a first in German history. This was followed in March 2013 by bans of several other Salafist associations, such as DawaFFM, Islamic Audios, and AnNussrah, a successor of Millatu Ibrahim. The organizations’ assets were seized and their infrastructure dissolved. According to Friedrich, German authorities gathered extensive evidence of anti-constitutional activities, which included turning against the German Basic Law, seeking Sharia Law, and calling for violence against other faiths, including Shiite Muslims. Friedrich initially prided himself on weakening the German Salafist scene – at least for a while. Indeed, immediately after 2012 raids, many members of the Salafist network left Germany. But, not surprisingly, a year after the ban of Millatu Ibrahim the German media has been presenting evidence that Millatu Ibrahim’s former members are regrouping and disseminating information predominantly on new websites, such as Tauhid Germany, Facebook, Twitter, and YouTube. The reach of the network also extended to the United Kingdom. The 2009-founded YouTube channel Salafimedia, United Kingdom, rebranded its image to revive Millatu Ibrahim, projecting their identity as the most authentic and most modern ummah (Muslim community). 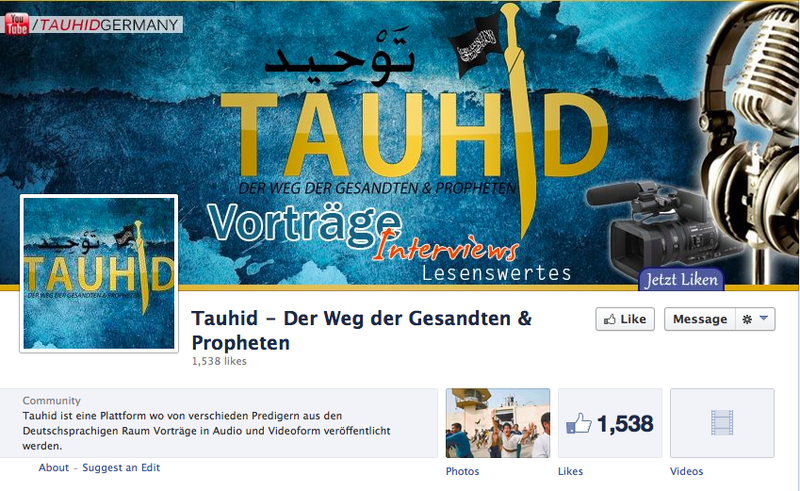 German security agencies fear the digital regrouping of Salafists. After all, Millatu Ibrahim was also initially an Internet project before it expanded into a network of anti-German activists. Tauhid Germany seems to follow that track: it conducted a phone interview with the former head of Millatu Ibrahim, the Austrian Mohamed Mahmoud aka Abu Usama al-Gharib, from a prison in Turkey. Mahmoud was arrested there in April 2013 as he tried to enter Syria and is now awaiting extradition to Austria. Mahmoud used this interview to urge German Salafists not to remain in Germany, but to fight for their brothers and sisters in Syria. Similar calls on German Muslims to fight in Syria prompts sarcasm in the media with headings translated roughly as extremist Syria tourism or taking a vacation in the holy war in Syria. Moreover, it also disseminated fear of Salafists returning to Germany radicalized. Scholars on Salafism warn against defining “Salafism” by its general characteristics or ideologies and instead describe it as a non-homogenous movement with mixed tendencies that spring up in different regions. While this is true, it is nevertheless important to point out that those ideologies are pervasively shared and strategically used to legitimize religious authority and to mobilize audience for specific causes. For instance, the Salafists reverse the moral order of media ideological binaries of the good West and the bad Islam. In their discourse, they morally upstage the opponent with claims to absolute clarity and purity, comparing themselves to Ibrahim al Islam who fought against false gods and idols. Salafists project themselves and their audience as “the best ummah” that will be “the foremost in jennah” (paradise). They construct their interpretation of Islam as an antidote of what they call modern Western evil or simply jahiliyya, by which they mean the return of the deviant way of life in Mecca before Islam. They call their audiences to “leave behind the doors of jahiliyya and enter Islam fully, in totality.” The German newspaper Die Welt reports on a 26-year-old Turkish-German Salafist, who admitted in German court to having severely injured two policemen in the 2012 protests against Pro NRW. Quoting the man in their title “Allah decides what is good and bad,” the article claims that the man justified this deed through his faith and declared the German court illegitimate. He was sentenced to a prison term of six years. Furthermore, Salafists are merging the ideology of a pure Islam with postmodern ideals of the autonomous and authentic self, providing their followers with a strong identity to distinguish themselves from the rest of society. They empower individuals by providing a universal alternative model of truth to any form of oppression, may it from parents, institutions, or capitalism. Every Muslim should be part of the revival of Islam and hence is an authority figure in representing Islam, which involves defending Muslims, especially in the countries of Afghanistan, Syria, and Palestine. In contrast to traditional Salafist movements that were products of their national and geographic environments, these present-day Salafist discourses also argue against any ethnic, national, cultural, or sectarian affiliations and for a global ummah that submits only to Allah’s divine rules. 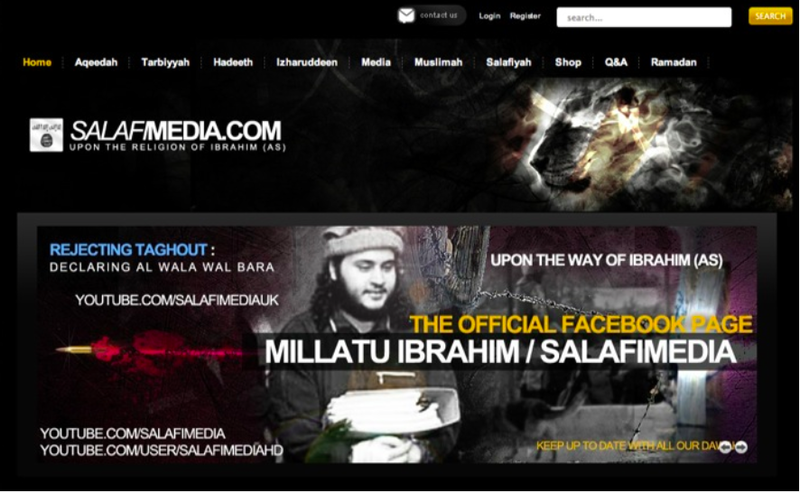 In addressing the ban of Millatu Ibrahim in Germany, Abu Waleed asserts on Salafimedia that Millatu Ibrahim is bigger than some group or organization – it is not even “a website, a dot-com.” He claims: “You can’t unsubscribe Millatu Ibrahim.” Even though they arrested the emir of Millatu Ibrahim, he continues, they cannot destroy the ideology behind Ibrahim al Islam. Through religious, social, and political practices in the online and offline realms, Salafists are hailed into new religious authorities: they are at the same time fitted to these practices and emerge from them. Online and offline expectations shape each other towards a common goal that is communicated through a common language. It is important to analyze how religious authority formation is conditioned by the logics of emergent technological systems, as well as the logics of local culture and politics. In the web of these environments, Salafist religious authority produces its own spiritual repertoire, its own discursive logic, and its own aesthetics of persuasion.